The small container is just for tidbits of ribbon – small pieces that can be used to tie a bow and paste on the front of a greeting card. The blue container was my first traveling embellishment holder. Inside the square grids, I have rolled pieces of longer ribbon. The box initially came with about a dozen clear plastic boxes. As you see here, I also rolled ribbon into them. They are really handy because you can pull out the length of ribbon needed and cut. And last, but definitely my favorite, is the little vintage bird suitcase. I purchased this mini suitcase from Tuesday Morning because I loved the design. I brought it home and started trying to figure out how to use it to hold ribbon spools. I knew it would work but wasn’t quite coming up with the right idea. I asked my husband and guess what? My “McGyver” came up with an awesome idea! He took a plain old plastic tube hanger (actually 2 hangers) and cut it the exact width of the box. I then stacked my spools onto the plastic rod and voila! I was able to get two rows of ribbons in the suitcase. It is super easy to see what I need and snip off a bit of ribbon. How do you store your ribbon for crafting and sewing? Please leave a comment and share your ideas! Some of you may know that when I am not working, I have an alter ego. Her name is CraftyNat. I love this girl – she’s the creative side of me. I have many different types of crafts that I do but my first choice is anything that involves paper. I love scrapbooking and making cards! The other day I was looking for a particular embellishment and found myself digging and grumbling. Uh oh…You know what that means… time to perform some maintenance on this craft closet! And the list goes on. How would you use these versatile boxes? If you want a set, you can order them online at my Clever container website – www.clevercontainer.com/Natalie. Today is National Thrift Shop Day. While no one seems to know who created this prestigious day, I am celebrating! Here’s a secret… I love thrift stores- so much so I have a monthly allowance for thrift store shopping. As a young mom with 3 kids and not much money, I discovered I could stretch my dollar by shopping at thrift stores. Now there are some things I wouldn’t buy there. Round up all those supplies! You can’t know what you have (or how to organize it) unless you have it all together. It’s a good ideas to do a “round up” about every 6 months; things get spread out as you work and new purchases don’t always get put away where they need to go. Remember to keep tools used for certain activities together. 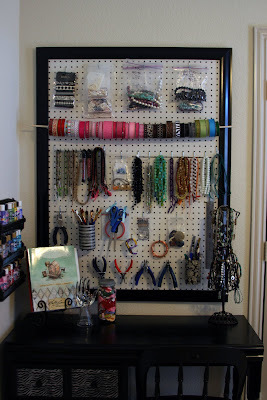 Here Tricia from Craft Addict keeps all of her beading supplies and tools together.